Smart-bend offers a unique approach to conduit bends through individual segments that “Snap-Lock” together. This concept allows bends to be assembled on site to provide various angles from 7.5 degrees to 90 degrees and beyond if necessary. Smart-bend can be adjusted axially to provide compounded angles which are particularly important when connecting misaligned wall and floor penetrations. 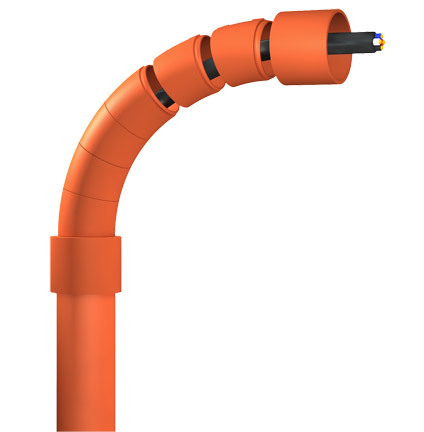 Smart-bend allows assembly segment by segment over pre-formed cable and helps minimise injuries associated with pulling cable through formed bends. Manufactured from high performance polymers and compliant with AS/NZS 2053 Smart Bend can be used with all types of conduits and comes in a range of service colours, Grey, Orange, White and Black.